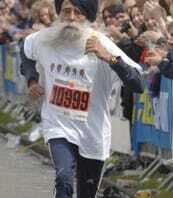 Fauja Singh is one of the world’s oldest marathon runners. Born in India in 1911, he moved to the U.K. after his wife died in 1992. To combat the boredom of sitting at home, Fauja Singh decided to take up jogging – and eight years later ran his first marathon in London at the age of 89. Since then, he has run seven more marathons as well as countless half-marathons. He holds world records for the fastest times in his age group at 100m, 200m, 300m, 800m, 1500m, 1 mile, 3,000m and 5,000m. Fauja Singh is 180 percent fitter than an average man of his age, and doctors say that he can continue running as long as his cardiovascular system is able to support his training schedule of 7-10 miles per day. Click here to read more about Fauja Singh. Words like oldest, fastest, youngest, and most inspiring are called superlatives. Superlatives are used to compare 3 or more things. Click here to review the rules about superlatives, then take the quiz below! That's _______________ movie I've ever seen! English is _____________ subject for me, and math is __________________. Brazil is _______________ country I've ever been to. War and Peace is ____________ book I've ever read. That restaurant has __________ food I've ever eaten. I'll never go back there again. Paris is considered one of _________________ cities in the world. _____________ class at the school starts at 7:00 AM. Jaina is ____________ student in the class. The world's ____________ train has a top speed of 581 kilometers per hour.